I just received news in the mail that I have a new occasion to celebrate. It turns out it’s been forty years since I was initiated into a sorority freshman year in college. 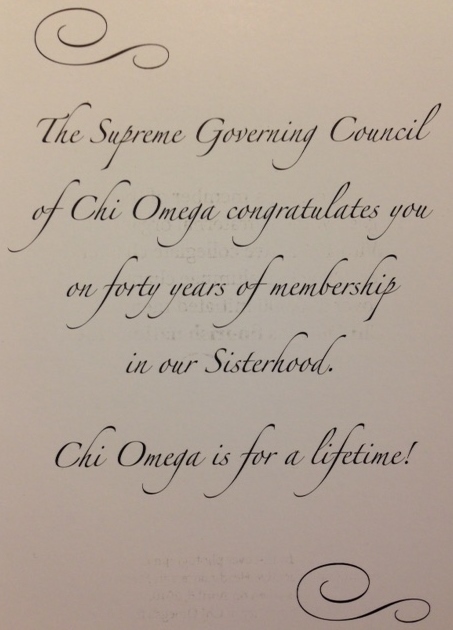 To be more specific, Chi Omega is actually a fraternity and not a sorority. At the time it was founded, sororities were more like little sister groups. Chi Omega was founded as a free-standing organization for women and designed as a fraternity, modeled after the fraternities for men. When I checked, there was only one alumni group to consider and it wasn’t really nearby. Recently, I’ve heard rumblings of a new group forming in my area. I’ll probably check it out when it forms, but I’m uncertain what I’ll be looking for. Sadly, I have no friends who date back to my college years. Perhaps it’s because I wasn’t there very long. After a year and a half, tuition and expenses proved too great for my family and I dropped out to work full time. It would be many years before I returned and when I did, my goals were different. Even though I had succeeded in the professional world without it, I still wanted the satisfaction of a college degree. Fortunately, I found a program that afforded me a great opportunity to study what I wanted, accepted my earlier college credit, and provided the flexibility I needed to study and work full time. By then, my children were in high school and college, so they weren’t as labor intensive as they had been. Graduating was a gratifying experience. I was fortunate to be able to share it with my children. I’d like to think I was a good example for them of pursuing a goal, even when there was no tangible benefit in doing so. Nonetheless, I regret not finishing college the first time around. Maybe reconnecting with my sorority (fraternity) would be my way of bridging that gap. Maybe not. If you enjoyed this post, please consider subscribing to my blog using the link on the right side of the page. This entry was posted in Holiday, Memories, Personal History, Stories, Traditions. Bookmark the permalink.